← February SNAP Monthly Connection Newsletter is here! Are you thinking of volunteering at an emergency communication hub? Or, do you want to understand more about how the hubs will function during a major disaster? If so, here’s an opportunity to learn more. Free training will be held on February 18th from 9 AM until noon at the Seattle Office of Emergency Management’s (OEM’s) Emergency Operations Center (EOC), 105 5th Ave S. This is a great opportunity to see and learn about the EOC, as well as see how hubs operate! For questions or to RSVP, see the Hub Roles Training flyer Feb 2012 (.pdf format). 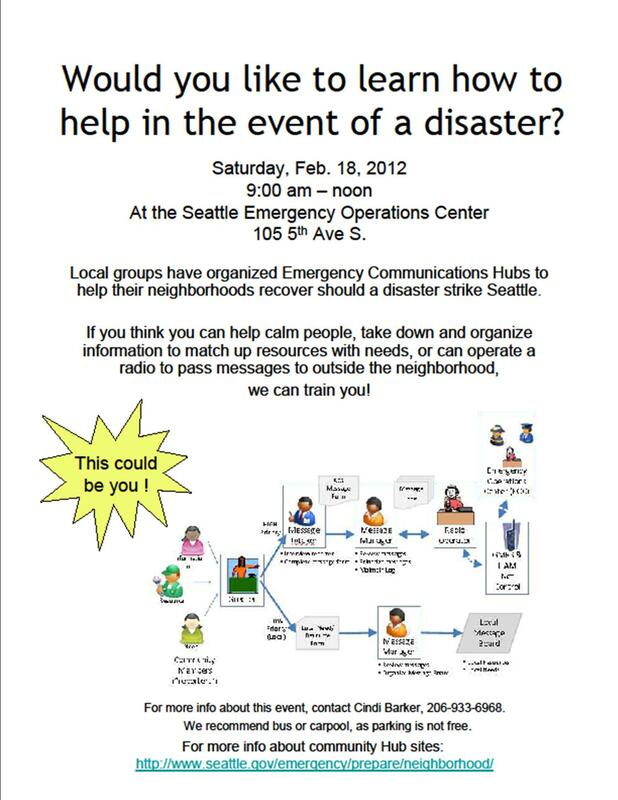 This entry was posted in Announcements, Events and tagged free classes, West Seattle emergency preparedness. Bookmark the permalink.